Visit the Home screen page on which you want to stick the app icon, or launcher. The screen must have room for the app icon. Touch the Apps icon to display the apps drawer. Long-press the app icon you want to add to the Home screen. Drag the app to the Home screen page, lifting your finger to place the app. A copy of the app’s icon is placed on the Home screen. The app hasn’t moved: What you see is a copy or, officially, a launcher. You can still find the app in the apps drawer, but now the app is also available — more conveniently — on the Home screen. Not every app needs a launcher icon on the Home screen. I recommend placing only those apps you use most frequently. The best icons to place on the Home screen are those that show updates, such as new messages, similar the icon shown. These icons are also ideal to place in the favorites tray. 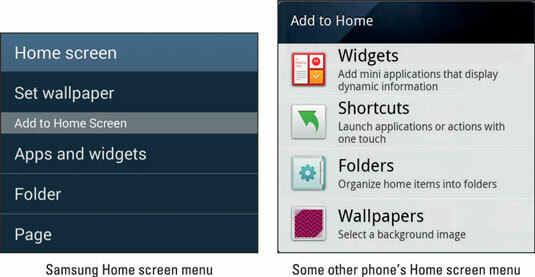 You can add apps to the Home screen also by choosing the Apps command from the Home screen menu. Often this command merely skips over Steps 1 and 2 in this section; you still have to long-press the icon and drag it to a Home screen page.